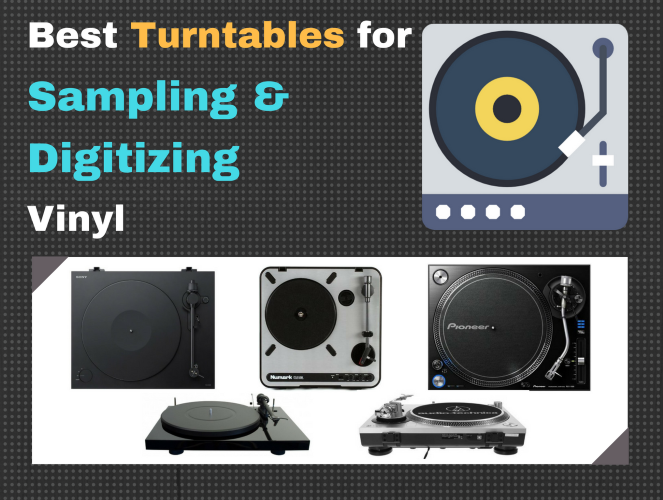 Let’s take a look at the best turntables for sampling and digitizing vinyl. Regardless of your final intended result, these players are perfect if you’re a music producer and need high-quality samples for beats and composition, or you’re a general user who just wants to enjoy your vinyl collection digitally. Quick answer: the top rated turntable is the Sony PS-HX500. But if you’re on a budget, the Numark PT01USB will do. Overview A top rated sampling turntable that will capture samples at a high-resolution sample rate. Ideally for sample-based producers or general users that want to digitize vinyl records, as it has some easy to use controls. Handy features include built in preamp EQ, software, and USB connector. A low cost sampling turntable that is portable, easy to use, and can conveniently connect to a laptop or computer. It overachieves for its price-tag in terms of features, but can be a little underwhelming in quality to the advanced turntable user or sampling producer. Considered an “audiophile” turntable, it’s also one of the best value sampling turntables, and a popular choice. Its unique design, smooth high-quality sound, and high-grade components make it attractive. But it lacks USB support, and requires some manual operation. A profession turntable built for pro turntablists for performances. Yet it still offers one of the best qualities you can get from a direct-drive turntable for sampling vinyl, with minimal Wow and Flutter, and lots of great features. A direct-drive turntable that’s also one of the most popular among buyers. It offers great quality AD/DA conversion, and a USB connector for handy vinyl digitizing. However, the sample rate is limited to CD quality (no hi-res) and the preamp leaves something to be desired. Take a look at the brief overviews and descriptions of each sampling table below. If you need helping making a decision, jump the buying guide portion of this post for further assistance. The Sony PS-HX500 is the top choice as the best turntable for sampling. It was designed specifically for recording vinyl to digital audio, so it has everything you would need for sampling at audiophile level high resolution, plus some very useful, and might I add, even necessary features that are lacking in other sampling turntables. Like USB connection for your laptop or computer, and an included cartridge that produces decent audio quality (which can be upgraded if necessary in the future). Right out the box, it’s a perfect fit. The Sony PS-HX500 sampling turntable uses a belt-drive motor, with a 9” tonearm. It features Sony’s “High Resolution” technology which produces what is described as a smooth, warm sound from vinyl at higher than the typical CD sound quality. This is great for audiophiles who want audiophile level sampling. You can change the speed via the control knob which gives you the option of 33 1/3 and 45 RPM. Another great thing is that it comes with a preinstalled cartridge, the Audio-Technica MM, which is considered a very good cartridge. It also has its own integrated preamp EQ as well, but it also allows you to play through the external phono preamp if you prefer another model. The structure of the sampling turntable is insulated with rubber dampers as well, which prevents vibrations from reaching the needle. The Sony PS-HX500 sampling turntable is also fairly compact and portable, and comes with software for transferring high-res audio to your computer. There is even a dust cover, which, despite the image, comes with the unit when purchased. The Sony PS-HX500 sampling turntable gets generally positive reviews from users, not just for its high-res sound quality, but for its ease of use. This includes setup and assembly. Even though it is not an “entry-level” sampling turntable, users find it “plug-and-play” thanks to the USB connector, software, and controls. However, a buyer quickly noted that the tonearm is manual, which necessitates being nearby when the record ends. Read the customer reviews on Amazon. The Sony PS-HX500 sampling turntable is the top choice because it offers the ability to transfer and record high-resolution audio from vinyls directly to laptop or computer. Add to that the built in optional preamp and convenient controls, and at this price, it's a great bargain. Many reviews and users suggest the Numark PT01USB as one of the best turntables for sampling around. What makes it the “best”? Well, it’s the cheapest item on this list. Added to the low cost, the sampling turntable is portable, so you can carry it around with you. It’s also belt driven, which produce the best sampling quality (less flutter and wow). Plus, you can connect it directly to your computer via USB for recording and importing your vinyl collection to your digital collection on your laptop or computer. 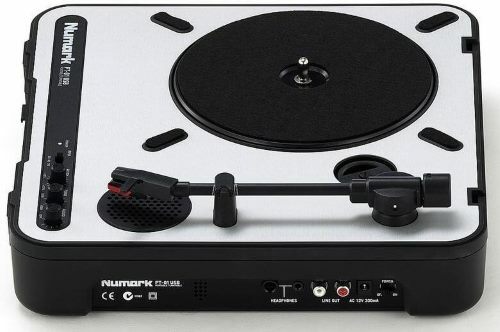 In addition to the useful features I mention above, the Numark PT01USB sampling turntable contains its own internal monitoring speakers, which though won’t replace your studio monitors, can certainly be useful. And despite it being belt-driven, it has pitch control capabilities of +/-10%. Though this is not entirely necessary if you’re in the sampling world (you can manipulate pitch within your DAW already) it is useful to have. The belt-drive motor has three speeds as well, 33, 45, and 78 RPM, and is powered either by a wall AC adapter or six “D” batteries. The adapter is included when you buy the sampling turntable, but not the batteries. The cartridge is also included with the package when you purchase, so no need to go looking for one when you by the Numark PT01USB sampling turntable. 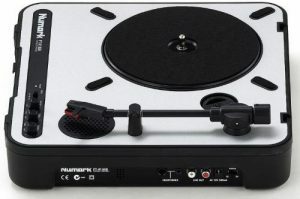 The majority of user reviews on the Numark PT01USB sampling turntable are generally positive. Users point out the fact that the Numark PT01USB is not an “amazing” product, but is sufficient for what it does. While buyer’s a general happy and satisfied with the sampling turntable, it’s also noted that it’s certainly not high-end. Users are quick to note that the construction is mostly plastic. But if you decide to upgrade the cartridge, this turntable could compete with some high-end variants. The Numark PT01USB sampling turntable is great if you’re on a budget, a beginner, and constantly on the move. While not the “best” in terms of quality, (if you want high-end, add a couple hundred dollars to your budget) it is certain “best” for the price. If you’re serious about sound quality, but don’t have an audiophile budget, the Pro-Ject Debut Carbon DC is the sampling turntable to get. It’s also rated the best turntable for sampling by many users, as it has an excellent price-to-quality ratio, with its high precision belt-drive motor and high-end tonearm. The components and parts are made out of high quality material, this results in a sound described as a “smooth, warm, clean” without being too clinical. The Pro-Ject Debut Carbon DC sampling turntable uses a low noise precision belt drive with synchronous motor. This is preferred to the direct drive system used on other turntables, as belt-driven turntables produce a higher quality for sampling. The Pro-Ject Debut Carbon DC sampling turntable also uses a hefty platter for record playing stability, and the 8.6” tonearm is made out of stiff carbon-fiber material (usually reserved for high-end turntables). You can also manually change the speeds from 33 1/3 to 45 RPM by hand. Perhaps the best thing about the Pro-Ject Debut Carbon DC, is that it comes with its own cartridge: the Ortofon 2M Red, a high quality cartridge that usually costs around the 100 dollar range. Those who bought and used the Pro-Ject Debut Carbon DC sampling turntable tend to be music lovers who're discerning about quality. Many users are either audiophiles or have some experience around turntables beforehand, and they generally appreciate the high-end sound quality that the Pro-Ject Debut Carbon DC sampling turntable produces. However, it requires some level of manual operation, as mentioned: you have to manual change the speeds by removing the record and platter to moving the belt to change the RPM. This, some users found, was inconvenient. Yet beginners and newcomers still found it simple enough to use. Overall, there are very little complaints, within reason, on the sampling turntable, with a generally positive review. The Pro-Ject Debut Carbon DC sampling turntable is the “best-buy” product on this list if you’re into sampling, or just generally relaxed music listening. While it requires getting a little “involved” in its operation, you certainly can’t go wrong with it. 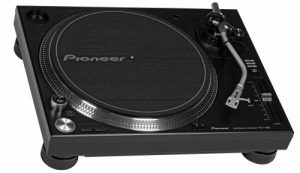 If you want the best turntable for sampling, with the flexibility of doing a little DJing on the side, the top choice is the profession turntable by Pioneer, the Pioneer Pro PLX-1000 direct drive turntable. It is certainly not the cheapest, but it offers some industry standard features which, for sampling, can be a little overkill. But it’s a good “ultimate” all-round sampling turntable if that’s what you’re looking for. The Pioneer Pro PLX-1000 is direct drive turn table. Direct drive may not "generally" be considered ideal for sampling, as they can be prone to Wow and Flutter. But this turntable is a high-end professional model. It has a Wow and Flutter measured in at less than 0.01%, which is more than sufficient for sampling records. And because of the high torque of 4.5 kgf-cm, it can withstand scratching as well. The Pioneer Pro PLX-1000 uses a quartz lock servo drive which will lock your speeds within 0.3 seconds of accuracy. You have a choice of two speeds, 33 1/3 and 45 RPM, and very wide pitch control of ±8%, ±16%, and ±50%. All of these features make the Pioneer Pro PLX-1000 sampling turntable super convenient. The general reviews are very positive. The Pioneer Pro PLX-1000 mostly sought after by professional turntablists, most who praise it for its stable, clear audio, and durability, no matter the environment, or even abuse. The only negative is that it doesn’t come with its own cartridge, and the arm lift drops drop pretty heavily. The Pioneer Pro PLX-1000 is really a turntable for a professional turntablist. If you see yourself heading in that direction, and want something that you can use for high-quality samples as well, you should take a look at this option. So you may be looking for a record player that you can use for sampling, but has the ability to withstand scratching as well, and falls within an affordable budget. In that case, a great budget option is the Audio-Technica AT-LP120-USB direct drive turntable. This is a super popular turntable, a buyer's choice on the market, and often one of the first recommended. It features a high torque direct drive motor and has a USB connector. It’s also filled with useful features that you may find convenient. The Audio-Technica AT-LP120-USB direct drive turntable features selectable speeds of 33, 45, and 78 RPMs, with a quartz drive that allows you to accurately lock your pitches. It has pitch control as well, where you can adjust either +/-10% or +/-20% ranges. With the turntable, you have two output options. You can use its own integrated stereo phono preamp to plug into your components, or you can use the USB connector with A/D D/A signal conversion to digitize your vinyl recordings, whether PC or Mac. It is not high resolution, though, but the stand CD grade quality. So you can keep that in mind. It also has its own dust cover, comes with recording software, and a decent quality cartridge. The Audio-Technica AT-LP120-USB direct drive turntable is the most popular item in this guide. The typical buyer for these turntables tend to be not as fussy about getting audiophile level quality. What is universally appreciated are the design and build quality, ease of use, such as the ability to change speeds at the push of the button and control pitch with slider, and fast assembly. However, a general complaint is the lackluster preamp performance, and the inability to transfer hi-resolution audio greater than CD quality. If you want the flexibility to sampling music but also be able to practicing scratching, this is the best budget option for you. 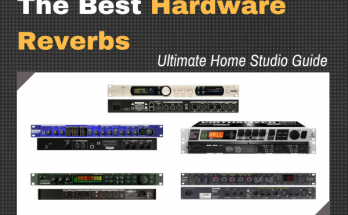 You may have to compromise on quality, as the preamp is not that great, and the USB connection will only transfer CD level audio quality, but some producers may not find that a problem. Sampling has been around for ages. Sure, the act of ripping riffs, breaks, and hooks, to use as a part of another piece of music has been in the music production scene from around the mid 1970s. But if we were to trace its prototypical beginnings in western music, as an art, you can find sampling taking place as early as Bach, who would literally copy lines of written music from popular compositions from other composers as the basis for his own work. Or even Mozart, who memorized choral melodies and wrote them into his own pieces. Skipping forward a few centuries or so, with the advent of hip hop music production, creative beatmakers found ways of turning popular funk tunes of the day into upbeat breaks. But moving toward the 2000s, some would say that the act of "sampling" was pretty much replaced by electronic music production, the typical music producer using audio synthesis as the means for generating beats and music, instead of tearing apart old recordings. But sampling is becoming super popular again in the music production world. This is partly because using "samples" has always been, and will always be, an important factor in making a great beat. This doesn't just include the bedroom producer, but the beatmaker on his pad controller, punching beats in a live performance. And, as you progress in producing music, you'll want to develop your own sample collection. Both record players refer to the way that the turntable spins the record on the platter. The description is pretty straightforward: Belt-drive turntables use a belt attached to a motor that turns the platter. Whilst the direct drive turntable has the motor connected directly to the platter itself. All things being even-keel, there is an advantage and disadvantage to each method of how a record player works. For belt-drive turntables, there's normally less "wow and flutter," meaning, since the motor is not directly spinning the platter, there is less chance of the motor's vibration reaching the record, which could otherwise impede the sound quality. This result in an overall better and more consist sound reproduction. However, the mechanism is more fragile, and is likely to break if your try to do any "scratching" or other ways of manually manipulating the vinyl. On the other hand, the Direct Drive turntables, particularly the ones with a higher torque power, are capable of the abuse taken from scratching, and hence are the preferred choice among turntablists. Moving forward, it makes sense then that the best turntable for sampling and digitizing vinyl is going to be a belt-drive turntable, since it produces the best quality. But also, it is overall the "safest" choice. This is naturally a debatable subject, as there are several forums online that debate whether or a belt drive turn table is really best for sampling, or general audiophile listening. However, with everything being equal, when we look at the mechanics of how turntables work, it makes sense that a belt drive turntable will be your best bet. It doesn't mean that there aren't great direct-drive turntables (and I included a couple), but your first consideration should be belt-drive. Any chance you'd need a direct-drive turntable for sampling? Sure. For instance, if you plan on doing more than sampling, but also scratching. In this case, care is needed in choosing a good direct-drive turntable for sampling. Take a look at the choices I mention in this post. There are three main speeds that record players normally use: 33 1/3, 45, and 78 RPMs. The most common are the 33 1/3, which are used to play LP (long playing) records, and the 45, which are used to play singles. 78 is far less common, but some record players come with that option, in case you run across a record that quires that speed. This is more common in direct drive turntables. This will change the speed of your turntable in order to correct the pitch. If you decide to get a turntable with pitch control, a pitch shifting range that's higher is better, naturally, as you have more room for correction (and to play with). If you plan on doing any scratching, a higher torque is better than lower. This means the record player can recover its speed very quickly after stops and manual manipulations to the vinyl while it's playing. Again this mainly refers to direct-drive turntables. Quartz lock/drive technologies allow record players to lock their time very accurately, which is great for mixing between tracks in a club or party setting. This is perhaps the most important part of your record player. It is where the needle is housed, and, as you may know, the needle registers your vinyls to reproduce sound. A high quality needle on an otherwise mediocre record player could make it contend with a high-end turntable. Cartridges are also generally up-gradable as well. A good cartridge to get if you plan on getting a new one is the Shure M44-7. Do I need pitch correction for a sampling turntable? Since pitch correction and shifting can be done on your laptop or computer using your DAW and plugins, or a simple tool like Audacity, getting a record player with pitch control is unnecessary if all you need is to transfer high quality samples. What is wow and flutter on a turntable? Also referred to as flutter and wow, just as the name suggests, refers to how the sound is reproduced when there are fluctuations in the reproduction of sound from analog players. You will tend to get this from low quality record players or tape decks that rely on a motor and mechanical parts to reproduce sounds. What is the best tonearm length? For various reasons, a longer tonearm length means less tracking errors. Though the longer the tonearm, the greater the mass and resonance. The standard tonearm length is 9." How to know when to replace a turntable needle? Take a similar or duplicate record that has hasn't gotten much plays, make sure it's clean and doesn't have any dust on it. Place it on your record player and play it with the current needle in question. If there are any distortions or the quality of sound is just poor, it's time to get a new needle. What is a turntable platter? Arguably the most important component of the turntable (other than the needle), the platter is the round spinning surface that you place your vinyl record on. It's important because a good platter will be stable enough to prevent unwanted vibrations from reach the needle stylus. How to get hi-res audio from turntables? There are two ways. Turntables with USB connectors make it easy, simply connect the turntable to your laptop or computer. Consult the instructions that come with your turntable's software, or your DAW to get hi-res audio. The other way is by the analog RCA connector, which most record players have. In this case you would need to plug your turntable into the "in" of a phono preamp, which outputs via TRS to an audio interface for your computer. If your record player already has a phono preamp built in with line-out, you can simple plug the line out via RCA to TRS adapter to your audio interface. Most audio interfaces allow for high resolution analog to digital conversion. Take a look at the top choices here. Hopefully by the end of this buying guide and review, you would've found the best turntable for sampling your record collection. 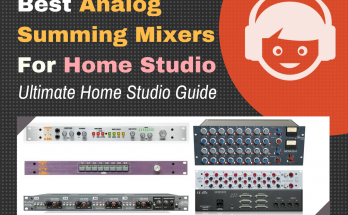 You would have acquainted yourself with knowing how to make the correct choice, whether you chose your sampling turntable from this guide, or found another suggestion the links provided provided by Amazon. If you have any suggestions to be added, or thoughts concerning sampling turntables, leave a message in the comment below. I'd like to hear from you what you think is the best turntable for sampling. Otherwise, please share this post with your friends, or someone that you think will find this information valuable.